There is something very striking (pun intended) about the combined sonority of piano and vibraphone: a sharp attack, with rich, mutually sympathetic overtones; delicate interplay within a halo of resonance – a sound of both clarity and diffuseness. This has characterised such diverse ensembles as the Modern Jazz Quartet, the serpentine duos of Chick Corea and Gary Burton in the 1970s, and even Pierre Boulez’s “Sur Incises”, a study in overtones, writ large. 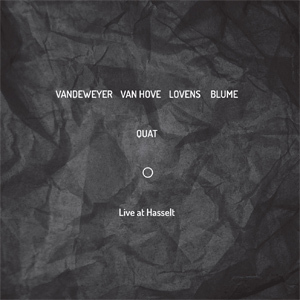 The Quat Quartet has its own, very distinctive voice, generated by what are in essence, four percussionists: Els Vandeweyer (vibraphone), Fred Van Hove (piano/accordion), Paul Lovens (percussion), and Martin Blume (percussion). The last three are seasoned improvisers, who need no special introduction, but Ms Vandeweyer was new to me. She is Belgian, studied classical percussion at the Royal Flemish Conservatory in Antwerp and jazz at the Royal Conservatory of Brussels and Musikhogskule in Oslo, and now lives and works in Berlin, where, according to her myspace entry: “she explores the middle ground between classical, jazz, and free improvised music”. On the basis of this recording, she is as exciting a vibes player as Chicago’s Jason Adasiewicz, and we need to hear a lot more of her. 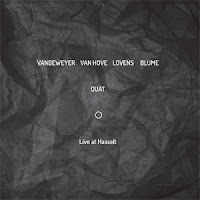 The quartet were recorded, live at the Belgium Arts Centre in Hasselt, in June 2011, with an excellent piano (sadly, it can make such a difference), sympathetically captured in a beautifully transparent sound, that allows one to relish the full dynamic range of their playing, largely focussed on the upper registers: the soft decay of a cymbal; Van Hove’s scrupulously weighted chords; the fizz of a hi-hat; burnished trills from the vibes, against micro-rhythms in the drums. On “H1”, the sheer gorgeousness of the quartet’s kaleidoscope of sounds makes an immediate impression – piano and vibes exchange arpeggios, then scurrying runs in a blur of notes – but there is a subtlety in the way the internal balance of the quartet is adjusted, as new ideas are introduced and elaborated. The use of two percussionists is inspired: there is more than enough room for Lovens and Blume to underpin, punctuate and embellish the texture. On “H2” there is a small gong, muted, then let free to resonate, which plays against the soft resonance of the vibes; the piano’s strings are muted (held), producing a sound that almost parodies the vibes, over which there is an eccentric clockwork pattern on the drums. This is not a mere academic study of timbre, however. All four revel in the novelty of their sound world, and there is real drama as the music unfolds, then suddenly changes focus. Most importantly, they appreciate the importance of understatement: when to hold back, or drop out. A fine example of the virtuoso listening – a term coined, I think, by Fred Frith – that is at the heart of creative improvisation. “H3” begins with bubbling vibes, forming a trio of ever more elaborate counterpoint with the percussion – metal to wood, back to metal again. The piano takes over, with a blurred line in the lower registers, gradually unfolding across the whole range of the keyboard, as the music builds to a crescendo, with sparks from the vibes, and then gradually fades, with soft tremolos accompanied by what sound like miniature bells. Van Hove introduces gentle chords on the accordion, as the music ebbs into silence, as if in slow motion. “H4” is a perkier affair: staccato chords and fractured lines on the piano, a much spikier, non-resonant sound from the vibes, and criss-crossing from the percussion; music that is never allowed to settle. As to the name of the quartet, I don’t know if this is a contraction of “quatre”; an alternative spelling of the name of an African plant, whose chewed leaves are a stimulant (they do produce an intoxicating sound); or the Frenglish for “what?” – apparently cool in Montreal (please, no); or something else altogether. Not essential, but I’d like to know. In the meantime, you can hear the quartet in full flow here (the sound is slightly weighted towards the vibes due to the camera position).